This discussion is being used to collect information on the history and evolution of the MTS file system. It will be good to capture more of this information before we all forget. In May 2014 the "MTS System Architecture" article in Wikipedia didn't talk about shared files or file locking. This discussion was used to gather information for an update and addition to that article which was completed on 7 June 2014. There is a 100+ page document that gives a quite complete description of the format and data structures used by the MTS file system at UM as of D6.0 in February 1988. Information on disk drives including disk types, revolutions per minute, latency (msec), transfer rate (MB/sec), number of cylinders, tracks, pages/track, capacity (pages), default PAT starting location, default PAT length. The format of the Volume Label, the PAT (Page Assignment Table), Relocation Entries, IPL information, DSCB (Data Set Control Block). The structure of the file system catalog, line files, and sequential files including SEQWL files. The format of the in memory shared file table. Information on console error messages, Disaster Recover, and file system testing (FSTEST). I do know the answers to some of these questions (as I'm sure Gary does too). Comments appear below. They were somewhat hastily entered so may have mistakes. but I think they were all compatible with some model of IBM disk. at least the first to have a native mode that we used? The first disks were 2311s. I think we used all the others you mention as well as a few oddball ones. Do you remember the super disk with for spindles and one actuator in a large case. MTS drove it so hard that it essentially melted and we were down for several days while the vendor (I forget now who it was) flew in a new one. These disks all emulated IBM disks, but some also had a native mode which MTS could use. This wasn't common, and I can't remember the details, but I'm sure there are tables in the distributions that would fill in some of these blanks. Did I miss anything? What came after the Amdahl disks? More IBM disks, probably 3390s of some flavor. By then we were very definitely an all-IBM shop. I know the file routines supported FBA [fixed block architecture] devices. Did U-M ever have any FBA disks? Yes, we had support for several FBA devices. It wasn’t hard since the file system used a fixed block size by then. Now that you mention it, I do remember the "super" disk. I think it was a 8800 from STC. That same issue of Computerworld has an article about the Superdisk on page 1. There were two models, the largest of which had a capacity of 800 MB, which was quite large for the time. Original comments and questions from Jeff are in black. Replies from Mike in blue. the MTS file system on disk (or data cell). the block size for files on disk wasn't a page (4096 bytes)? The block size was never 4096 bytes until we went to page formatted disks. 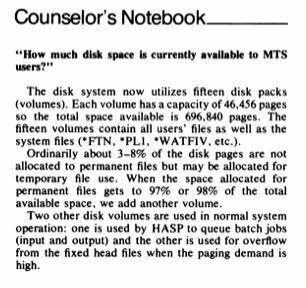 Before that the basic disk format was derived from OS/360, not TSS. Each track was formatted into a fixed number of records that filled the track up. On early disks I think it was one record per track, but later on there were more. Tracks were formatted the first time they were allocated (or maybe each they were allocated). before that they only contained a record 0 and no other records. utilities until the move to VAMX. There may have been a VAM or VAM1, but it never got outside IBM. VAM2 was the format used by TSS and adopted by MTS when it went to page sized records on the disk. At that time we also preformatted the disks so MTS could assume the page sized records were already there. VAMX was essentially the same as VAM2 except for one small, but important change. Page addresses on the disk were 32 bits. In VAM2 this consisted of 4 bits unused (except in DSCB pages), 12 bits volume number, and 16 bits page number. Disks got big enough that 16 bits wasn't enough for a page number so in VAMX the division was 4, 8, and 20. Other than that I think VAM2 and VAMX were the same. label, PAT and relocation entries, and DSCBs? The catalog was entirely MTS's (mostly Gary's) invention. The label format is from OS/360 (mostly) while the DSCBs, PAT, and relocation entries are taken from TSS. 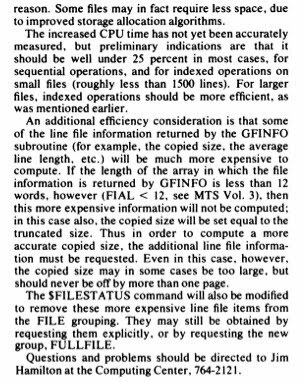 So, before page formatted disks, MTS file buffers were larger or smaller than 4096. Weird. I have 4096 baked into my brain. And before page formatted disks, file space was allocated in terms of tracks rather than pages or records? Yes, that’s why old FS tapes show file sizes in tracks, not pages. - fine names are only 16 characters long when there was room on disk [in the DSCB] for 44 characters. On 7 June 2014 new sub-sections on "Shared files" and "File locking" were added to the "MTS Systems Architecture" article in Wikipedia. The new sub-sections are an update of the draft that follows with changes suggested by Gary Pirkola and Mike Alexander. The "MTS System Architecture" article in Wikipedia doesn't currently (May 2014) talk about shared files or file locking and so I'm gathering information for an addition to that article. Here is a draft of a possible addition. Comments, suggestions, and corrections welcome. Over time the sharing of files between MTS users evolved in four stages. Stage one allowed for limited file sharing, where public or library files (files whose names start with an asterisk) were readable by all users and all other files (user files) could only be accessed by their owners. Public files were owned and maintained by Computing Center staff members, so at this stage only Computing Center files were shared. Stage two allowed for limited file sharing, where the program *PERMIT could be used to (i) make a file read-only (RO) to the file’s owner and all other MTS users, (ii) make a file available for copying by members of the same project as the file’s owner using the program *COPY, or (iii) make a file available for copying by all other users using the program *COPY. As for stage one, by default owners had unlimited access to their own files and the files were not accessible to other users. Stage three allowed for “really shared files”, where the $PERMIT command or the PERMIT subroutine can be used to share a file in a variety of ways with lists of other users, projects, all other users, or a combination of these. The types of access that can be allowed are read, write-extend, write-change or empty, renumber or truncate, destroy, and permit. As for stages one and two, by default a user file is permitted with unlimited access for its owner and no access for others. A file’s owner’s access can also be changed, although an owner always retains permit access. The $FILESTATUS command or FILEINFO and GFINFO subroutines can be used to obtain a file’s permit status. Stage four added program keys (PKeys) to the list of things to which a file can be permitted. Thus files can be permitted to users, projects, all other users, program keys, or a combination of these. Program keys were associated with MTS commands and files, which allowed files to be permitted to specific programs or to specific MTS commands. Among other things this allowed the creation of execute-only or run-only programs in MTS. The PKEY subroutine can be used to shorten the program key of the currently running program or switch the program key of the currently running program to *EXEC and later restore the program key, allowing a program to voluntarily limit the access it has to files by virtue of its program key. As part of “really shared files” (stage three), file locking was introduced to control simultaneous access to shared files between active MTS sessions (that is, between separate running tasks or processes). File locking does not limit or block access to files within a single MTS session (between command language subsystems or user programs running as part of the same MTS session). File locking in MTS is mandatory rather than advisory. Files are locked implicitly on first use of a particular type of access or explicitly using the $LOCK command or the LOCK subroutine. Files are unlocked implicitly when the last use of a file within a task is closed or explicitly using the $UNLOCK command or the UNLK subroutine. The $LOCKSTATUS command or LSFILE and LSTASK subroutines can be used to obtain a file’s or a task’s current lock status. A file’s lock status may be “not open and not locked”, “open”, “locked for read”, “locked for modify”, “locked for destroy”, “waiting for open”, “waiting for read”, “waiting for modify”, or “waiting for destroy”. Locking a file for modification also locks the file for reading and locking a file for destroying also locks the file for modification and reading. Any number of jobs can have a file locked for reading at any given time, but only one job can have a file locked for modification at any given time and then only if no job has the file locked for reading, or locked for destroying. Only one job can have a file locked for destroying at any given time, and then only if no job has the file open, locked for reading, or locked for modification. When an attempt to lock a file cannot be satisfied, the calling task will wait either indefinitely or for a specific period of time for another task to unlock the file, or until an attention interrupt is received. If the file cannot be locked, an error indicating this is returned. The file locking software detects deadlocks between tasks and returns an error indication. Gary, am I remembering this early history correctly? The first of it was before my time at the CC. Library (public) files are readable by all users and modifiable by people who know a special password (limited to CC staff). User files are readable and modifiable by their owners and no one else. Really shared files added file locking and the ability to permit files to ccids, project ids, and pkeys as well as initial substrings of ccids, project ids, and pkeys using the $Permit command in a wide variety of ways (read, write-change, write-expand, destroy, …). File locking and deadlock detection was introduced. I think that that is pretty much it. Were pkeys introduced at the same time as the ability to permit to ccids and project ids? 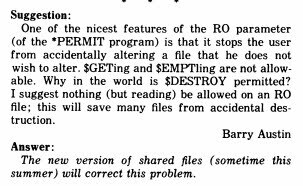 Before file locking was introduced what, if anything, protected a file that was being read by some users and modified by its owner at the same time? I assume that needing a password to modify a library file was discontinued at stage (2) and from then on there was really nothing too different about library files and user files. I guess I could go read your IEEE paper, but I don't have a copy at home and am too lazy to go to the U-M Library. Sorry about not answering sooner, but I wanted to go back and read a couple of MTS file system papers myself. It became possible to "permit" user files to be readable (read-only or RO) by all other users. There was a program to do this, but I forget its name, was it *Permit? My memory is not very clear about what was available/possible at this intermediate stage. Mike? Did we really have "read only" data files for example or just "run only" object files for users? Good question. Mike? Was there any way for the “lower level system” or higher level MTS command interface to detect and prevent this? There was nothing in the file system proper that I remember before really shared files, but I can’t image that we would have just let this happen? If we only had run only object files, this would not have been quite so serious a problem. I’m not sure. If we had something that worked for library files, and something else that worked for Read Only/Run Only user files, we might have just let both continue as is, until we implemented really shared files. Mike? 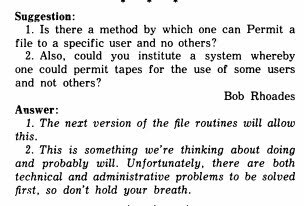 Since I did end up finding and rereading a couple of these MTS file system papers, I’m motivated again to organize and let you look at some of my CC historical archive stuff. Maybe when you’re over here for the "Baja photofest", you can see what I have and if it looks interesting, you can take a couple of boxes home for further investigation. It's part of the answer, but not quite all of it. I've attached two sections from the 3rd edition (November 1969) of Volume 2 for *PERMIT and *COPY. If you're really interested, I've also attached the source for both of them from D2. I also have extracted the source for OPEN, FCBEQU and CATEQU from D2 if you want them. Although the writeup for *Permit talks about both a "how" and a "who" parameter, it really only takes one parameter other than the file name. If present, it must be one of "RO", "ALL", "NONE", or "PRJNO" where "ALL" is the default. RO makes the file read only to everyone, including the owner. "NONE", of course, makes it unlimited to the owner and no access for anyone else. "ALL" and "PRJNO" interact with *COPY. If either of these is given then others (either all others or in the same project) can copy the file using *COPY but not access it otherwise. I think the owner still has write access but I didn't verify that. Hence the snippet from the Newsletter that maps *PERMIT to Really Shared Files is a bit misleading. "ALL" maps to U Owner, R All, but they aren't really the same since *Permit's "ALL" only allowed access by *COPY. files to be accessed by other users. Purpose: To allow files to be shared between user ID numbers. Usage: The program is invoked by a $RUN command. What = the name of the file to be shared. if Read-Only is not desired. changed, even by the owner of the file. and checked before being permitted as RO. Who = the sharers who are allowed to access the file. Currently three classes of sharers are allowed. ALL - meaning all users (default). 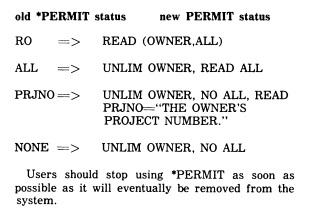 project number as the permitting user. number" on the tail-sheet of batch runs. NONE - meaning no one else. of the file under a new user ID. permits the file to be Read-Only shared by all users. permits the file to be copied by all users via *COPY. sharing class, until an end of file is read. (line or sequential) from one user account to another. the location of the object module. SPUNCH - Output of the files being copied. was specified in the $RUN command. user's file is not permitted. read until an end-of-file is reached. tenation specified in the "from" file will be ignored. operate exactly as they would on an MTS $COPY command. Thanks Mike. This is interesting. I vaguely remembered *PERMIT and RO files. I didn't know about or forgot about *COPY. 1) Make the files RO to everyone including the owner so that the issue of simultaneous changes to files that others have open cannot occur or at least not unless you un-permit the file using *PERMIT and in that case we just cross our fingers and hope that things work out. And at least for fairly small files where the entire file will fit into a task's file buffers, things should work out OK.
2) If the files are permitted, but not RO, then let *COPY worry about the simultaneous access issues. 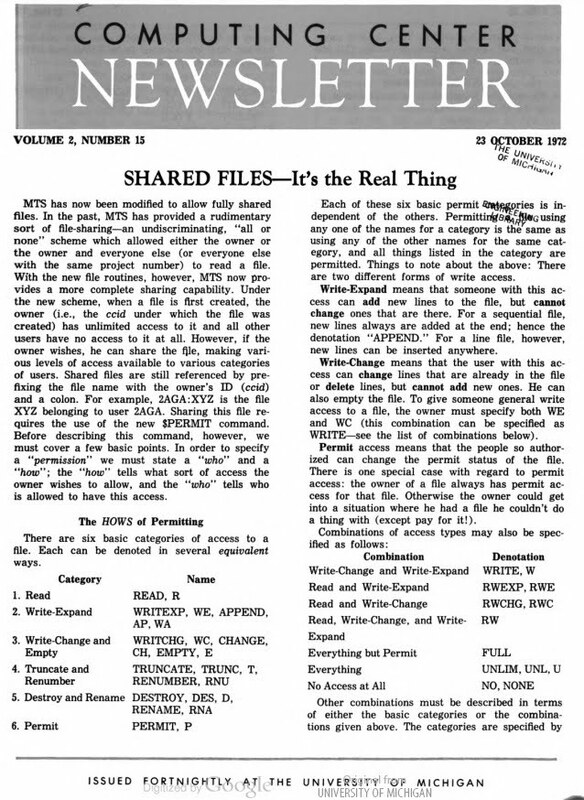 I'm going down this path partly because I'm interested and partly because the "MTS System Architecture" article in Wikipedia doesn't currently talk about shared files or file locking and so I'm gathering information for an addition to that article. It's not quite that good. *COPY didn't worry about simultaneous access issues, it just copied the file and hoped it happened quickly enough that it got something consistent. At least the original file couldn't be damaged by this, even if the copy was corrupted. In practice I never heard of a case in which this caused problems.